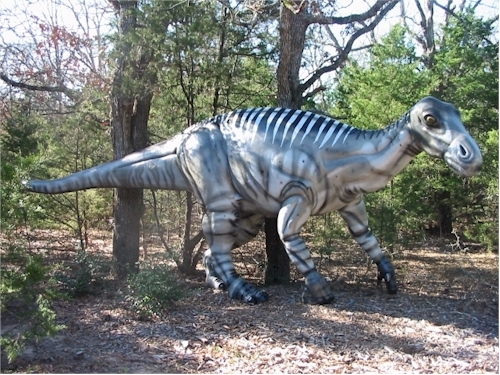 Iguanodon has become quite famous as a result of its starring role in Disney's movie, Dinosaur, but before that it helped people understand what dinosaurs really looked like. It was one of the first complete skeletons ever found. This allowed scientists who had never seen a complete dinosaur, to figure out what it would have looked like in life. In fact, the first time this common dinosaur was found as just a partial skeleton, scientists put its thumb spike on its nose! Its teeth were discovered in the early 1820's in England. As nothing like it had ever been described in scientific literature, the teeth of this creature were a puzzle that an amateur paleontologist named Gideon Mantell solved by comparing them to the teeth of living animals. Mantell found that the teeth looked like those of a modern iguana and named it Iguanodon. He speculated that it was a huge extinct version of this modern reptile. It was in 1878 in a coal mine in Belgium that dozens of skeletons were found. Although the specimens were of a larger species, they clearly showed what this creature looked like in life. Remains of Iguanodon have since been found throughout the world, indicating that it was a very successful group of dinosaurs. Footprints of Iguanodon are common and have shown that it usually walked on all fours. It could, however, rear up onto its two back legs in order to fend-off predators and to use its hands to gather food. The thumb spike was defense as well and for obtaining food. The spike was the size and shape of an upside-down ice cream cone in some species, and as small as two inches long in others.